Carr Clifton is a photographer that I have talked about before in On Landscape (in "The Rightful Heir to Eliot Porter?") 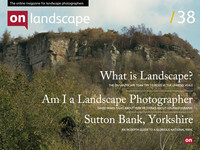 and who is probably one of the hardest working landscape photographers covering environmental issues. The Sacred Headwaters book is one I have been trying to get hold of for some time and I have to thank Paul Marsch for loaning me his copy to peruse and review. The book isn't actually a Carr Clifton production - it's written by Wade Davis with the majority of photographs by Carr. However, the photographs are wonderful - many of them aerial shots of the Sacred Headwaters - an area of British Columbia bordering the Yukon and North West Territories. The book's narrative which makes up nearly the first half of the book (with photographs on nearly every page) documents the history of the native people and their recent interactions with Big Industry who have manipulated their way into large scale development on these lands. Carr's photography complements this text well and really comes into it's own in the back half of the book which is 100% images. As you can see from the extracts below, the complement of large scale overview with details of nature and indigenous population. This is a wonderful example of an environmental collaboration between the photographic and the written in the aid of an important cause, one that Robert F Kennedy compares with the damming of Glen Canyon, documented by Eliot Porter in 1963 . You can find out more about the cause itself by visiting the Sacred Headwaters website. The book is available direct through the website or more conveniently via Amazon.